The Soccer Fitness Foundation Specialist Certification presents the basics of where energy comes from and how the different energy systems work together to provide fuel and aid with player recovery. From fundamental fitness training skills to soccer physical demands, you will be able to identify appropriate volumes and intensities to improve all the major components of soccer fitness. Our complete certification course provides the tools you need to achieve your Soccer Fitness Foundation Specialist Credential and expand into the sports market. The Soccer Fitness Foundation Specialist Certification course is suitable for a wide array of health experts and professionals including personal trainers, group fitness instructors, chiropractors and chiropractic assistants, soccer coaches, physical therapists, massage therapists, athletic trainers, registered dietitians, occupational therapists, safety experts, physical education teachers, recreational activity instructors, registered nurses, physicians, osteopaths and other allied health professionals. Show off your Specialist Credential with our Distinguished “Professional Soccer Fitness Foundation Specialist” Certificate. I learned a lot of new things from taking this course. I gained new ideas for training my clients, not just for soccer, but for other sports as well. After reading this material, I feel like I could really train/coach someone through the sport. Very comprehensive .... covers all aspects of improving soccer player performance. Great ideas on how to improve weak links in performance and technique. The material is easy to read and well put together ... excellent information!! 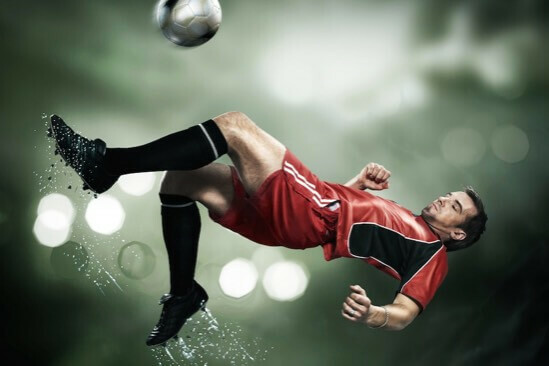 This program is laid out in a format in which concepts build on one another and allow for the trainer to gain perspective on the sport even with no prior training in soccer. This course was very informative and provided a detailed program for understanding, teaching, benefiting and excelling in the sport of soccer. Trainers, coaches and therapists will all benefit from this course.